OUTSTANDING PERFORMANCES BY ALL THE CAST ESPECIALLY WILL SMITH, ROSARIO DAWSON AND WOODY HARRELSON. A WONDERFUL STORY, WHICH IS SUBTLETY UNCOMFORTABLE AND OVERWHELMINGLY BEAUTIFUL. 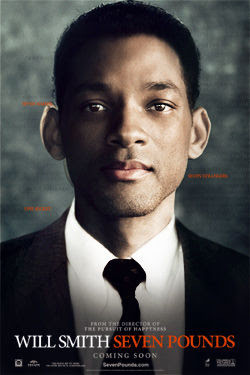 WILL SMITH IS A MAN WHO ACTS SELFISHLY AS WELL AS SELFLESSLY IN THE QUEST TO DO RIGHT. A FANTASTICALLY MOVING AND INSPIRATIONAL SOUNDTRACK BY ANEGELO MILLI. HOWEVER MY FAVOURITE COMPOSITION IS MISSING FROM THE SOUNDTRACK AND IS 'THE CRISIS' BY ENNIO MORRICONE, WHICH ACTS AS A DELICATE LACE OVER THE MOST POIGNANT MOVIE MOMENTS.